In 1906 the last horse cars and cable cars were banished from the city’s streets. Meanwhile, the various privately-owned street railways had been consolidating. The final merger took place in 1914, with the creation of a company called Chicago Surface Lines. CSL operated mainly within the Chicago city limits. A few of the lines crossed into the suburbs, and there was even an interstate route that extended into Hammond and Whiting. But the suburbs were still tiny, and CSL didn&apos;t bother with them. Larger towns, like Evanston and Oak Park, had to depend on their own transit carriers. 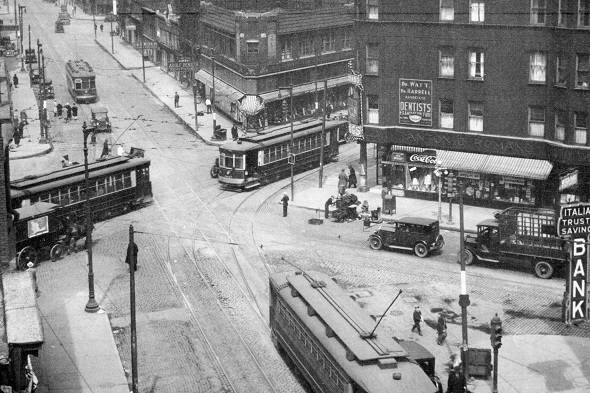 A Chicago streetcar was a two-man operation — “man” is appropriate here, since CSL crews were all male. The motorman was the driver. He operated from a standing position at the front of the car. Since his vehicle was on tracks, he didn’t have to worry about steering. Fares were collected by the conductor. Passengers entered at the rear doors, paid the conductor, and passed into the car. When everyone was aboard, the conductor signaled the motorman by clanging a bell, and off they’d go. Exit doors were in the front. 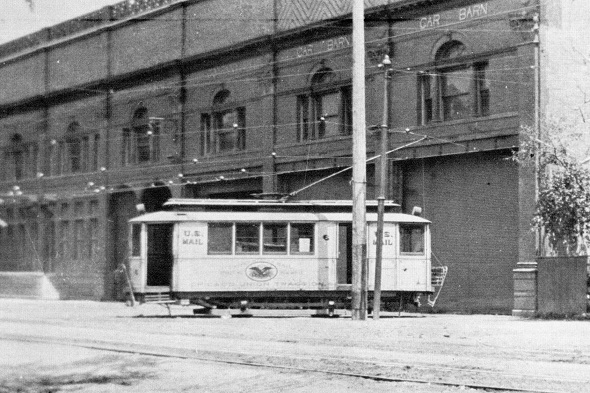 Car stops were indicated by a white band painted around the black pole that supported the trolley wire (see picture below). Passengers waited on the curb, then walked into the street to board the car when it stopped. 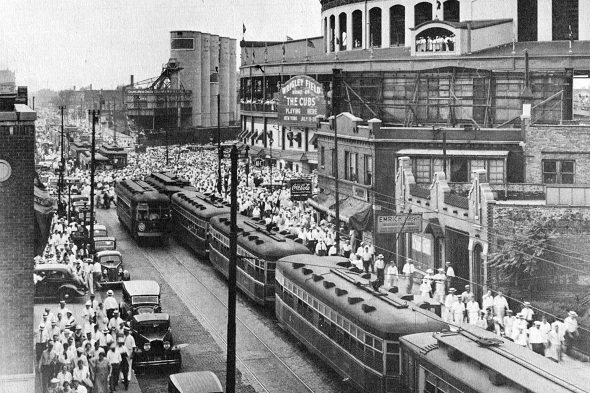 Wide streets, like Western Avenue, had safety islands located in the street next to the track. When CSL was founded in 1914, fares were five cents — equivalent to about $1.10 in today’s money. Payment was in cash. Boarding passengers could request a free paper transfer, which allowed them to ride on other lines for a two-hour maximum. Service was frequent. In rush hour you seldom had to wait more than a minute for a streetcar. Even in the middle of the day, five or six minutes was the norm. Many of the lines had all-night “owl” cars operating on a headway of about fifteen minutes. 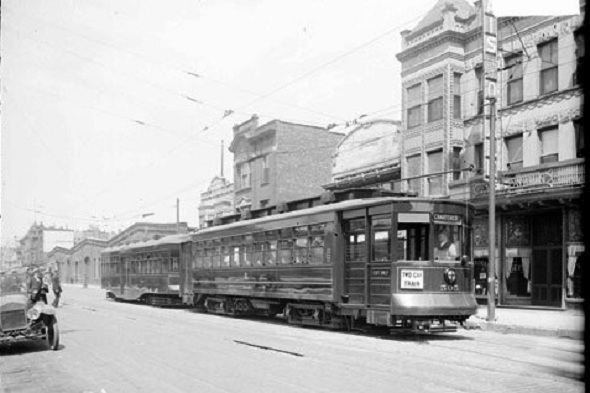 In an era before automobiles and trucks, streetcars were used for other jobs besides public transit. They hauled mail, took prisoners to jail, plowed snow, and shuttled patients between hospitals. There were even funeral cars. By the 1920s CSL operated a fleet of over 3,000 cars on 172 routes over 1,060 miles of track. With 3.6 million fares collected each day, it was the largest city transit system on earth. 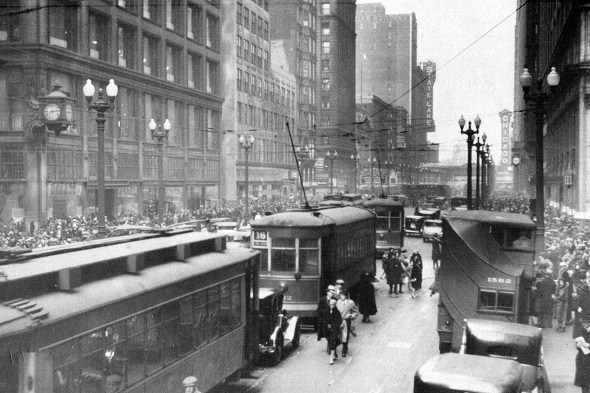 Friday--a final look at Chicago streetcars!